Gail Herrine approaches a large rectangular cage in her backyard, asks her "girls" if they'd like to come out and hoists the coop several inches off the ground. Out stroll Dottie and Tina, two of Herrine's nine pet chickens. Herrine scoops up Tina, a Partridge Cochin born last year, gently strokes her black and red feathers and lets her loose to join her sister at the edge of the yard. Dottie and Tina share space with seven chicks on Herrine's one-acre property in suburban Bala Cynwyd, just outside Philadelphia. Elsewhere, too, in places ranging from Nixa, Mo., to Pasadena, Calif., chickens are being moved from barnyards to backyards and raised as pets by animal lovers and organic gardeners alike. "It's quite aesthetically pleasing to watch the chicken wander around the yard," said Herrine, 41. "My husband was not particularly interested in having chickens - he's away all day - but when he comes home and they're wandering around, there's something really cool about it, having fowl in the yard." Julia Orth's family has raised 38 chickens in the last decade. They bought their first fowl - an adorable batch of day-old chicks - 10 years ago from a feed store near their Cedar Hill, Mo., home. Orth, then 11, and her brother fed the "little fluffballs" each morning and cleaned their reddish-brown coop each afternoon. The chicks, virtually indistinguishable at birth, gradually developed individual personalities - and amusing habits as well. They'd indulge in dust baths. They'd preen themselves and each other. They'd peck at Orth's braces. They'd even fall asleep as she sang to them. "The best part was having a large group of animals and knowing them as individuals and being able to watch them interact one-on-one," said Orth, now 21. Deborah Collier, also of Bala Cynwyd, says her eight chickens faithfully follow her around the yard. "I know that people have this idea of chickens that they peck or they'll claw when you try to pick them up," Collier, 50, said. "But in reality, if they're raised with you, they're domesticated animals and they're really very sweet. They give back." 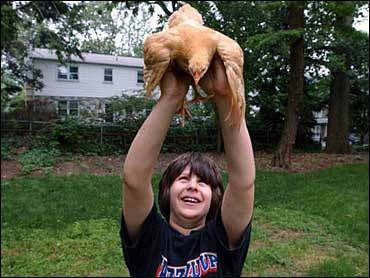 Others, though, raise chickens for more utilitarian purposes. They gobble up worms and other garden pests. Their nitrogen-rich droppings are excellent fertilizer. And their eggs, with distinctively darker yolks, are far more natural than most store-bought ones. "They're productive for me. For me, they're a profitable thing, but for our children, it's more fun and a personal liking," said Jules Dervaes, 56, of Pasadena, Calif., whose family grows its own produce and raises five bantams. Several keepers of pet chickens said their animals had proven vulnerable to disease and predators. Orth lost at least 12 to cancer. Another two were killed by a raccoon, a third by a red-tailed hawk. One of Dervaes' tunneled underneath a brick and was squashed to death. Amber Landers, 18, who keeps 24 chickens at her family's home in Nixa, Mo., says two stray dogs once devoured more than two dozen of her chicks. "I cried for a month," she said. Even so, chickens are relatively low-maintenance animals, explained Bud Wood, co-owner of McMurray Hatchery in Webster City, Iowa. People interested in raising fowl, he said, should have a ready supply of chicken feed and water, and a heat lamp to keep the chicks warm. "It's all in the management," said Wood, whose 6-year-old daughter keeps about 25 chickens at home. "As long as you keep their coops clean, and they have fresh water and they're managed well, chickens will do quite well." Herrine admits that her chickens aren't as close to her heart as, say, her dog. No matter: she has a strong affection for Dottie, Tina and the gang anyway. "I don't see any end to having them," Herrine said. "I'll have them for as long as we're here, and my kids are in school, and I can take care of them regularly."